Icelandic horses are the size of ponies and have long-haired manes. If you're looking for a vacation trip that isn't half a globe away, Iceland is a place well worth considering. The little island with an 800-mile circumference is an extremely interesting place to visit, and is considerably different from most other tourist attractions. In fact, in recent years, Iceland has become one of the biggest tourist attractions in the world. Some two million visitors annually visit. Tourism, along with fishing, farming, and the production of aluminum and Icelandic wool, is one of the biggest businesses in Iceland. In our case, my wife and I were part of a 30-person Roads Scholar group that, led by a well-informed tour guide, traveled last fall by bus around part of the 40,000-square-mile island during a busy 12-day visit. Along the way, while traveling from the southeast side of Iceland to the north-central part of the country, then back to the southern city of Reykjavik, we stayed in four different hotels, each well-kept, comfortable, and stocked with a friendly staff. To get to there, we started with a drive from Philadelphia to Newark International Airport. Icelandair has service from Philadelphia to Reykjavik only from May to September and only four daily flights per week, and our trip was in October. Newark offers daily service through several airlines, including Icelandair, which Roads Scholar had arranged travel with. After the 5½-hour flight to Keflavic International Airport, about 30 miles from Reykjavik, we quickly learned that Iceland is full of natural attractions, ranging from mountains and geysers, to waterfalls, fjords, and thermal ponds. It's also full of nice people – the population is 340,00 — and has a fascinating history. Plus, getting around the country is easy, especially if you're with a sanctioned travel group. "You are about to go on a trip that you will certainly never forget," said our tour guide Inga Gunnarsdottir as we started out. She was certainly right. You might not want to live there, but visiting is a fine idea. Although the landscape may be the focal point of a trip to Iceland, nothing serves as a bigger attraction than the country's animal population. Once you enter the countryside, horses and sheep can be seen almost everywhere and form an absolutely incredible picture. Iceland is the home of 500,000 sheep, a breed that was first brought to the country in the late ninth century. Many reside in fields far away from their farmhouses. Indeed, most sheep return to the barns only twice a year, and then just to be clipped for their wool before getting sent back to the fields. One of the highlights of our trip was visiting a horse farm. 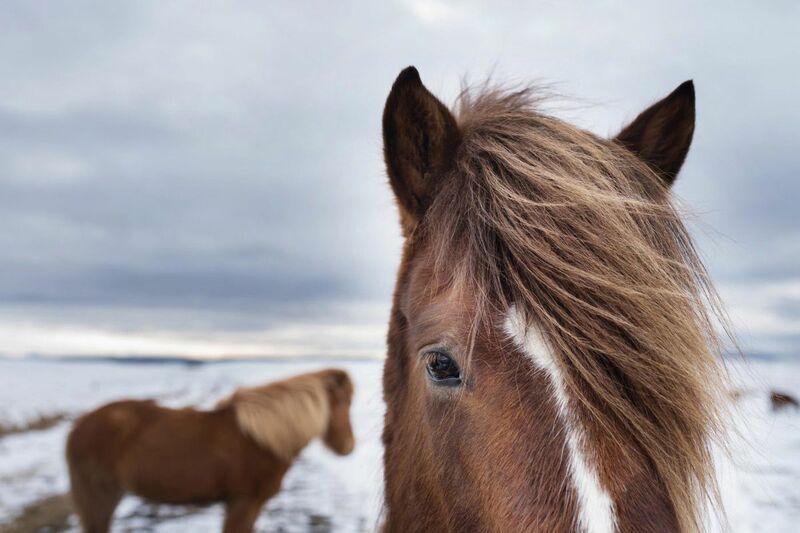 (Iceland is home to 85,000 horses, with a size akin to a pony and long manes; to prevent the spread of diseases, no horse can be brought into the country, including exported horses that are not allowed to return.) Four horses trotted back and forth around a track with their riders guiding them in an interesting performance that included an exhibition of the horses' five gaits, which is one more than American horses have. In addition, with three friendly dogs, including a gorgeous Icelandic sheep dog, joining us, we entered the stable where we patted and chatted with the many horses in residence. Wild animals are rarely seen — only red foxes and minks are native to Iceland. Some polar bears swam across from Greenland to the northern shore of Iceland after the waters warmed and the ice melted. Reindeer arrived from Denmark in the 1700s. The country is said to have 75 different breeds of birds (including eight million puffins) and 150 species of insects. Iceland's history goes back to 940 AD, when it was claimed that about 400 Vikings, discontent with the politics of Norway, established the first settlement with its own Parliament. In time, women, many from Denmark, migrated to Iceland, and the population continued to expand with new residents arriving from across Europe. Iceland had more than its share of problems as the centuries came and went. Living under Danish rule, the country experienced an unending collection of catastrophes between the 14th and 18th centuries, including epidemics, volcanic eruptions, internal fighting, and vastly declining temperatures. In 2008, all of Iceland's main banks collapsed in the world's financial crisis; the economy has recovered, due to some extent to the rapidly increasing tourism. Iceland was granted a constitution of its own in 1874 and home rule in 1904, and it became an independent republic in 1944. During that decade, it was home to a major air force base, first stationed by the British, then by the United States, with 50,000 troops there during World War II. That has since become the country's international airport. A statue in Iceland pays tribute to trolls, which some people still believe exist in small hideways. Today, among the 340,000 people, about 10 percent were born in other countries. Much of the population willingly speaks English, but Iceland has its own language, obvious in the names of native citizens as well as towns and streets. (If you were born in Iceland, you are not permitted to give a child an English first name.) There are nine political parties – the country is led by an elected prime minister — and 23 counties, 60 post offices, and 4 colleges, along with elves and trolls that many believe occupy various hidden sections of the country. At its closest points, Iceland is 615 miles west of Norway and 108 miles east of Greenland, and its northern end is just 55 miles below the Arctic Circle. Geographically, it sits on the border between Europe and North American, and in fact, at one tourist spot, you can stand with one foot in one continent and one foot in the other. Small islands dot the shores of much of the country, most of them unoccupied. The entire country is run on renewable energy. (It is the third-windiest country in the world.) There is no oil drilling. Except for aluminum, manufacturing is virtually nonexistent. Only one of five people own cars, which is probably good because most roads are two lanes with at best a 50 mile-per-hour speed limit. There is no train service beyond the trolleys in and around Reykjavik. Surprisingly, the average year-round temperature in Reykjavik exceeds that of New York. January is the coldest month, averaging highs of 35 and lows of 27; the warmest is July, with 55 and 47. During the winter, Iceland has about four hours of daylight per day; in midsummer, that rises to 24 hours a day. Wages average $14 per hour. Some people leave the country in search of higher-paying jobs; many others stay to run small businesses and farms. Altogether, there are 4,000 farms in Iceland, with potatoes, carrots, turnips, and tomatoes being the main crops. Despite being inconsistent and somewhat controversial, Iceland's financial status has gone from one of the poorest countries in the world to one that is described as a "booming economy." Houses can cost well over $200,000, and even those who rent houses must pay real estate taxes. High prices prevail on most consumer goods, too. There is a major volcano eruption every three to five years with some 250 volcanoes having erupted since 1900. Once covered with ice, glaciers now cover only 10 percent of the country. But even today, landslides, earthquakes, tremors, lava spills, and floods are constant threats. Typically, in the winter, the northern part of the country is covered by three and one-half feet of snow. While 25 percent of the country was once covered by forests, today woodlands occupy just two percent of the land because much of it has burned down over the years. On one of the nights we stayed in Reykjavik, Iceland's national soccer team was playing in Turkey in the qualifying round for this year's World Cup. In an open square in the middle of the city, several thousand cheering fans watched on a huge television as the tiny country virtually clinched a spot in the quadrennial tournament for the first time. The Blue Lagoon is a huge, beautifully colored blue pond that sits atop a bed of thermal lava. Another highlight at the top of anybody's list is the Blue Lagoon, near our first hotel on the Reykjanes Peninsula. A huge, beautifully colored blue pond that sits atop a bed of thermal lava, it was packed with people taking advantage of its 98-degree temperature. Yours truly was one of the few who actually went swimming. The others mostly just stood in the water, which is said to have special healing powers. Whatever the case, the provided an invigorating experience. The Gullfoss waterfall in southern Iceland is one of the country’s most spectacular sights. The Gullfoss waterfall — Europe's most prolific hot springs, with views of mountains capped with glaciers, volcanoes (many of which had erupted over the years), and a hot stream that flowed between a rocky cliff where local residents once swam naked — is vastly different from, but easily rivals, Niagara Falls. Unfortunately, we did not travel to the northeastern part of Iceland where the highest mountains fully covered with glaciers dominate a picturesque scenery. While driving along the west side of the country, we stopped for a two-hour whale-watching cruise where a gang of humpback whales demonstrated their up-and-down water skills. Another cruise that departed from the fishing village on the Snaefellsnes peninsula took us out on a working scallop fishing boat. A fish-processing factory in Grindarik was also on the itinerary, as were visits to shark and whale museums, and to a fishing village called Stykkisholmur. Numerous museums were on the itinerary. One was the homestead of famed 10th century Viking poet Egill Skallagrimsson. Another featured an exhibit of wool, national costumes, and sewing tools such as old spinning wheels. Still another was dominated by an art collection with paintings dating to the 1800s. Then there was a visit to a museum located on an old farm, which focused on rural life in the 18th and 19th centuries. Other stops along the way included the exploration of the world's biggest nesting grounds for wet birds at Lake Myvatn, located close to Akureyri near the top of the island and one of 2,757 lakes in the country. We also visited a tomato facility where thousands of plants produced the red vegetables in an indoor factory, a geothermal power plant that sends out 100 gallons of natural gas per second, and an ancient bishopric. In addition, we heard lectures on agriculture, the Middle Ages and the struggle for independence, flora and birds, geology, and one called "Contemporary Iceland." Lutheran churches are in the majority in Iceland, this one holding three services each Sunday morning in the 50-seat sanctuary. In a country where Christianity was adopted in 1,000 AD and Lutherans now comprise 75 percent of the population, we visited five churches, including one with a 50-seat sanctuary that held three services every Sunday and amazingly had a membership numbering 2,000. We stopped at the oldest church in Iceland, where the minister sang and played his guitar in an enjoyable concert for his guests. In yet another stop, we visited Iceland's largest church, a remarkable building in downtown Reykjavik. The trips between our overnight stays, including ones in Borgarnes, Akureyri, and Reykjavik, were often long distances from one stop to another. Usually, much of the passing scenery consisted of lava fields. If it hadn't been for the interesting information provided by our tour guide, the travel along narrow, two-lane highways in a bus driven by a skilled driver could have been boring. The last part of the tour included a 45-minute ride from Akureyri to Reykjavik, the northern-most capital in the world. With a population of 125,000 (of which 200 are homeless), it is really the country's only urban area. It includes a U.S. Embassy building, museums, a soccer stadium, an attractive waterfront, numerous stores and office buildings, and many excellent restaurants. Among our best visits there were ones at a cultural center, an early settlement museum, and a botanical garden. On our last night, we finally saw the Northern Lights, which were beautiful and something I'll never forget. "I thought it was a great trip," said Jim Montgomery, a member of our Roads group and a worldwide traveler. "There wasn't anything I didn't like about it."